PASADENA, Calif. — On the morning of the public memorial service for Neil Armstrong, the first person to walk on the moon, NASA officials called for a new era of cooperation between human and robotic space explorers in an era of tighter budgets. Space agency officials spoke of a future where astronauts and robots would work together to explore the scientific mysteries of other planets and to expand humanity's foothold in space. Their words could bring about a truce of sorts, after years of historic budgetary battles between NASA's human exploration program and its robotic science efforts. "Let's stop pitting science against exploration," said Colleen Hartman, director for science, operations and programs at NASA's Goddard Space Flight Center in Greenbelt, Md. "The battle between humans and robots is a false one and a waste of time." About half of NASA's proposed $17.7 billion budget for 2013 is slated to go toward human exploration — a trend unchanged for the past decade — with almost $5 billion reserved for the robotic science and exploration program. 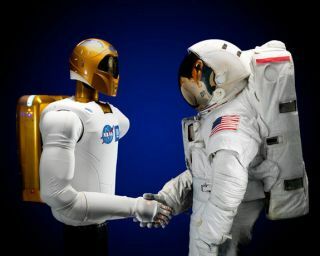 But the time is right to find new areas for human-robot cooperation and even redefine the old meanings of exploration and science, said Lt. Gen. Eugene Tattini, a retired U.S. Air Force officer and deputy director of NASA's Jet Propulsion Laboratory here in Pasadena. Tattini moderated the morning panel, which was called "Human and Robotic Space Science." All the NASA center directors sitting on the panel echoed the idea of merging human and robotic capabilities in future space missions, regardless of whether their centers had traditionally supported human spaceflight missions or robotic science missions. "The human-robotic interface is going to be key to our success now and in our future," said Robert Cabana, director of NASA's Kennedy Space Center in Florida. "You've seen the robotic devices we use to support astronauts in space. It's absolutely phenomenal." Human missions going to the moon, asteroids, Mars or deep space will need robotic housesitters that can watch over outposts between visits by crews, said Stephen Altemus, director of engineering at NASA's Johnson Space Center in Houston. He pointed to an early example in Robonaut 2 — the humanoid robot aboard the International Space Station that will get a pair of gripping legs to climb outside the orbiting lab in 2014. Even as robots take over routine and risky jobs (such as spacewalks), humans could potentially do much more meaningful science with their robot buddies. Future missions may have astronauts controlling robots on planetary surfaces from orbit, riding on robotic rovers, and even wearing robotic gloves or full-body exoskeletons to boost their natural strength and mobility, Altemus said. The idea of eliminating the traditional divide between human and robot missions emerged in the planning stages of NASA's Curiosity Mars rover mission, which landed on the Red Planet. Aug. 5. Curiosity's mission represents a natural stepping stone for possible cooperation on human-robot efforts such as a returning a sample of Martian rock or soil to Earth, researchers said. "Curiosity is controlled by people but is smart in its own right," said James Garvin, chief scientist for the science and exploration directorate at NASA Goddard. "It is a forerunner for what we could do with people."